I love watching documentaries and last night I fell for The Short Game (exclusively available on Netflix). 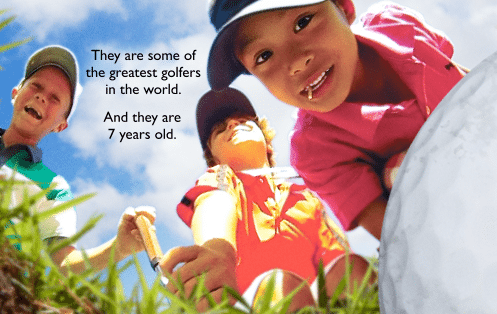 The film follows eight elite child golfers from around the world, all under the age of 8, as they compete at the Junior Golf World Championship which is basically their Superbowl. We follow these focused and disciplined youngsters as they train and practice, and never have tykes looked more like adults as these do while swinging on the greens. But then, a missed shot is followed by an epic tantrum or the camera cuts to typical childhood shenanigans and you remember that to count their ages, you only need two hands. The Short Game reminds me very much of the ballet documentary, First Position, which follows young dancers as they train for and compete at the Young America Grand Prix, and which I enjoyed very much. But The Short Game is better, and this is coming from someone who was a ballerina and couldn’t tell you the difference between a birdie and a bogey. The Short Game goes at a quicker pace and you really fall for the kid golfers and their parents. These kids are intense, yet they can be very silly. Preternaturally wise, some of these kids will blurt out insights that could easily be found on framed quote posters. And then, they’ll be found throwing sand at each other. They are easily upset with themselves for a missed shot, but they’re also strong-willed, fearlessly arguing with their loving and sometimes-overbearing parents. By the documentary’s end, you realize that The Short Game is not just about the kids who are learning to deal with the pressures of competitive golf. It’s about their parents, too. The world of elite sports is new to almost all of them, and they too are being trained on how to be the adult in the parent-child relationship, even though they are just as ambitious and prone to disappointment as their child athletes. I have so much more to say and want to talk about it, but I don’t want to spoil anything. Go watch it! You and your kids will enjoy it very very much.